Will other states follow in California's clean energy wake? 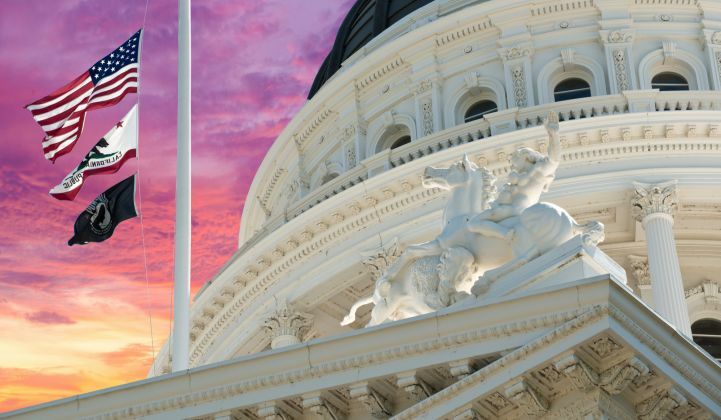 California lawmakers just passed a historic 100 percent clean electricity mandate. A few years ago, advocating for 100 percent clean energy was considered radical. Even some political allies argued that the concept was so far-fetched it was damaging to the climate movement. Democratic podcast co-host Brandon Hurlbut recalls the early days of championing 100 percent renewables as a member of the Solutions Project — and the lessons learned. Next, we hear from Georgia Public Service Commissioner Tim Echols, to learn how his red Southern state became a top 10 U.S. solar market without any incentives. And we explore how other states can follow in California’s clean energy wake. Subscribe to the Political Climate podcast via Apple Podcasts, Google Play, TuneIn, Overcast, Stitcher and Spotify.